Are steroids now accepted in UFC? 11-Feb-2013 by THF in Hoot's Corner | Comments Off on Are steroids now accepted in UFC? UFC welterweight Matt Riddle has a right to be upset about the current state of drug enforcement used by the athletic commissions these days. Just one event after Chael Sonnen was allowed to compete against Anderson Silva in the biggest pay-per-view (PPV) of 2012 while using testosterone replacement therapy (TRT) to boost his levels of testosterone in training, Riddle scored his first finish in two years with a “Submission of the Night”-winning performance. When asked about the current state of testing and punishment by the commissions during his appearance this past Wednesday on The Verbal Submission (listen to the full rant here), “Deep Waters” unloaded on everything related to TRT, especially in light of the fact that Vitor Belfort was given a free pass to take it for his second round knockout over Michael Bisping this past month. No he didn’t, he has a doctor’s note so it’s okay. And honestly, I think it’s ridiculous. The reason why they say I can’t use marijuana is because it’s a performance-enhancing drug. Okay, I understand that. It’s a performance-enhancing drug to you. Whatever. But testosterone isn’t? Steroids aren’t? And if you’re saying I can’t smoke because you need to keep other fighters safe or myself safe because I’m too high, don’t you think you should keep others safe by not letting people using steroids into the cage? That’s how I look at it. And that wasn’t the only item with which Riddle took umbrage. Not one to hold his tongue, he went into detail on his use of marijuana, explaining how it has helped him in his every day life while railing against the testing protocol and how “the man” is trying to keep Mary Jane down. “And on top of all that, it wouldn’t bother me if they tested for THC, because I would never fail for THC because I would literally have to be that high when they tested me or I’d have to be high the day before. Instead they just test you for metabolites which you just mentioned which can stay in your system for up to a month after you’re done smoking. Let’s be honest. It’s White America, it’s the big man, it’s the guy with the money, it’s the pharmaceutical companies, it’s the alcohol companies that don’t want want marijuana legalized and they’ll do anything. They’ll ridicule it, they’ve already had slanderous campaigns about it. 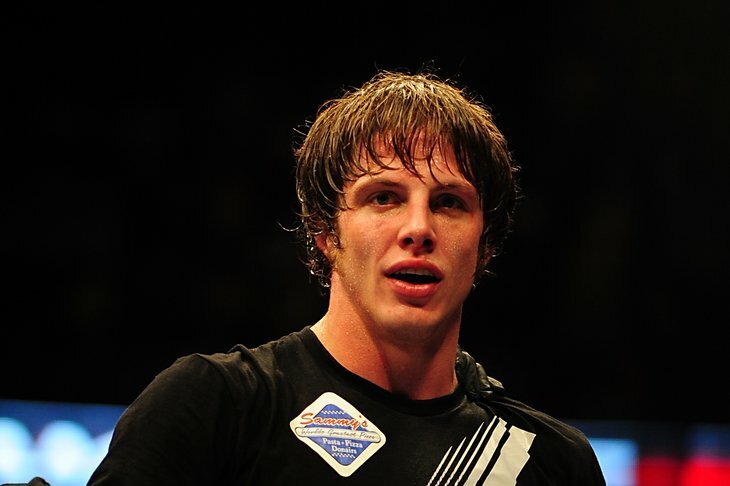 Riddle will be taking his talents to the Octagon next Saturday night (Feb. 16, 2013) when he battles Che Mills on the main card of UFC on Fuel TV 7, and he’ll be doing it without the aid of TRT (or even THC). “Deep Waters” has professed he’ll focus on his strengths instead of simply trying to win a “Fight of the Night” in every one of his bouts, which is probably for the best if he wants a lengthy career in the promotion. That doesn’t mean he won’t be trying to equal his knockout of Dan Simmler from The Ultimate Fighter (TUF) season seven, which he still believes is the most brutal finish in TUF history.